Get inspired! Pictures of the latest in landscaping designs and ideas for the perfect yard or outdoor entertaining space. When one’s garden landscape is but a small area of a dozen square yards or so, it is great fun to do one’s own landscape planning with graph paper and sketch pad, since with a limited outdoor space little can go wrong. Should the place be more pretentious, running to a half or two acres, it might be money in one’s pocket to consult a landscape designer or an experienced nurseryman. For the passionate DIY landscaper there are several excellent landscape design software and apps free downloads to try where valuable ideas for landscaping, landscape pictures and information will be found for creating your own landscaping designs. 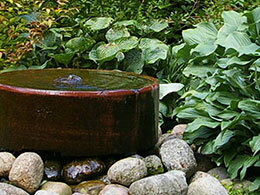 Fountains and garden pools are the latest in great landscape ideas. 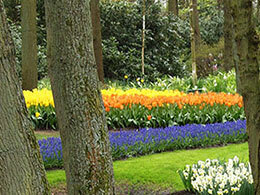 Landscape designs overflowing with beds of colorful flowers. 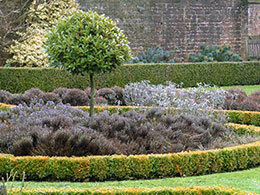 Boxwood hedges are a landscaping feature in formal designs. 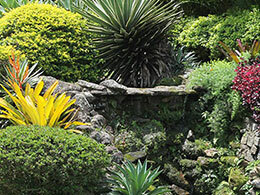 Landscaping designs with foliage and plants that thrive in a rock garden. Beautify outdoor living environments with a patio stone or pavers walkway. 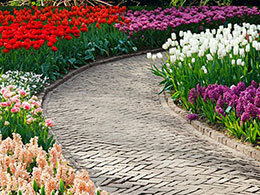 Artistically designed landscape borders frame colorful flower bed designs. 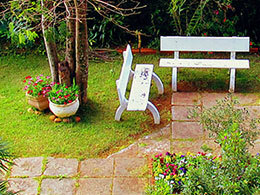 Backyard landscaping ideas can feature pavers, shrubs, trees and other foliage. 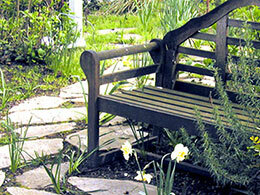 Unlike marble or stone benches, wood seating is not cold to sit on and can be easily moved. 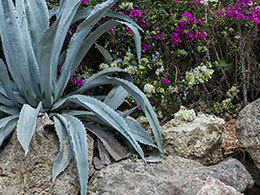 Plants that thrive in rock gardens are small and compact, and tend to be drought-resistant. There is a wide selection of landscaping software containing an assortment of outdoor planning features that encourage the DIY homeowner to drop his pencil and graph paper and pick up a mouse and try the best 2016 landscape design online tools. 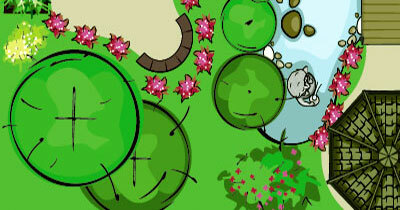 Here we provide landscaping designs, ideas and pictures to supplement your program. The first considerations in the composition of the landscape about one’s home are privacy, variety, shelter, and entertainment. The planning and arrangement of the features of the grounds surrounding the house should be as carefully considered as the choice and placement of the furniture inside one's home. 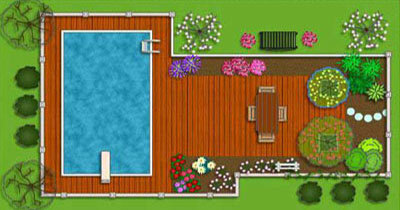 Today the home garden and backyard landscape has been transformed into a functioning outdoor living space with elaborate ideas for landscaping decks, patios with pool designs, fountains, ponds and other hardscape features which can be positioned on a working template with the best landscape design online software. With all-weather televisions, outdoor speaker systems, solar powered lighting, and luxury patio furniture -- an outdoor living space is the latest must-have entertainment area. Most landscape designs software and landscaping apps have progressed to include a database of drag and drop icons to complete this popular area of landscaping designs. 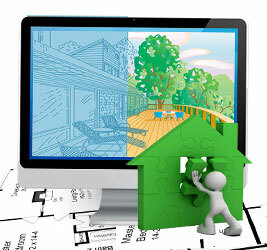 Pro Landscape Companion App allows users to visualize their outdoor landscape, and then create an online landscape design on the iPad using a photo taken with the tablet’s camera. 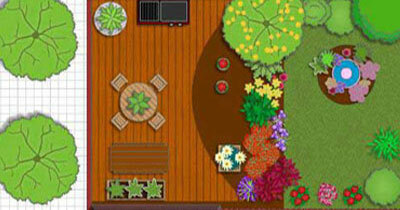 Users then have the option to transfer the backyard landscape designs to a computer and finish it in the Pro Landscape software. 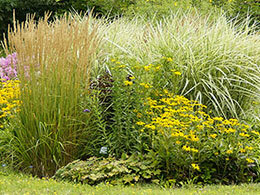 Ornamental grasses offer beautiful upright shapes that look great all winter long. 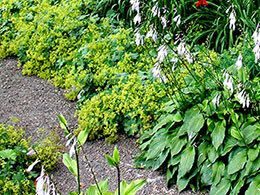 Gravel path edged with hosta creates a charming walkway in backyard landscaping designs. 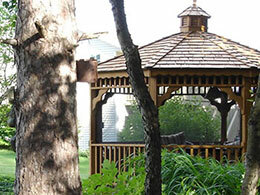 When relaxing in the outdoors, what could be better as a backyard hideaway than a quaint gazebo? 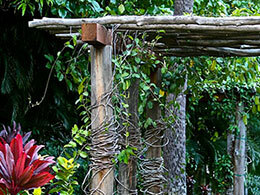 On a hill overseeing a garden or situated by a pool, a pergola is an eye-catching landscaping element. 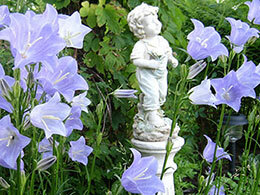 Enliven your landscape with garden statuary to accent a garden path or create a focal point. 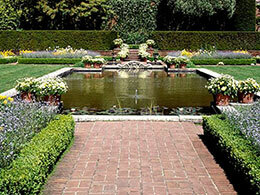 The shape or outline of formal ponds are generally symmetrical, with one side a reflection of the other. 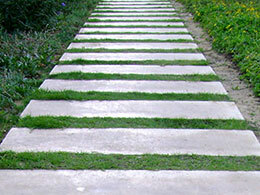 Stone pavers are generally the most preferable material in hardscaping a backyard path or walkway. 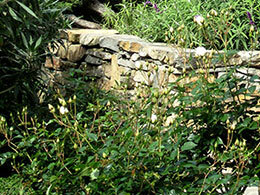 Stacked slate retaining wall provides earth tones, rich textures and varied contours for a sloping yard. 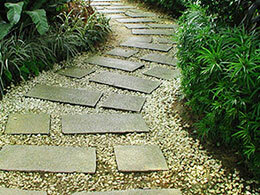 A popular landscaping method of laying a stepping stone path is to use gravel as a filler between the stones. 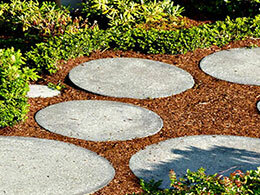 Hardscape features are paths, steps, edging, patios, decks, pools and other hard components in yards. 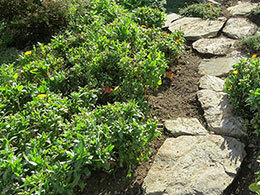 Skip the expensive, labor-intensive formal path for a natural looking stone path and perennials. 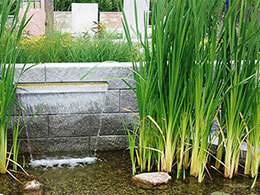 Nothing gives landscaping designs more picturesque charm than outdoor fountains or water features. Moreover, the arrangement of the driveways and walkways, the grading of the lawns, the drainage when necessary, and the planning of sheds, patios and decks should all be preconceived and reconciled into organized and practical ideas for landscaping. 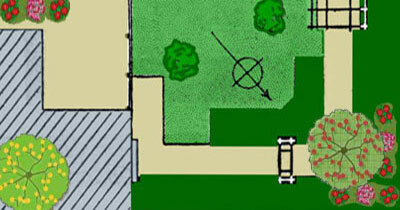 As far as possible there should be no mistake about the key permanent hardscape features. Choose landscape design software that lets you create a digital landscaping designs of your yard in order to define and map your home site. The best landscaping apps and programs will help to choose and relocate trees, shrubs and foliage at the beginning of the landscape planning process. 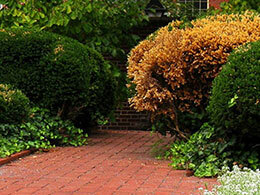 With large trees or the heavier groups of shrubs the expense of removal and shifting prohibits this being done later except out of dire necessity. Realtime Landscaping Pro by Idea Spectrum is landscape design software largely geared toward homeowners or smaller landscape designers with advanced 3D design. The free trial software contains a small listing of the plants and materials found in their retail counterparts, but they do not expire and they contain all core landscape program features. In the end, the minor landscaping features surrounding your home may be improved upon a great deal in the coming years and almost surely will, as new ideas for landscaping assert themselves. This changing of secondary landscape features is a part of the pastime of gardening and can easily be accomplished with a landscape design software and online landscape design planners and apps. With these landscaping design tools, one may considerably alter the contour of a shrubbery border along a paved walkway or may indeed eliminate it altogether. The same holds for ideas for landscaping flower beds and landscape edging, which are easily altered, removed or added to with the touch of mouse using even the most basic free landscape designer program. Finding a free trial download of the best landscape design online software helps the DIY homeowner enjoy the process of creating and embellishing his own outdoor haven.